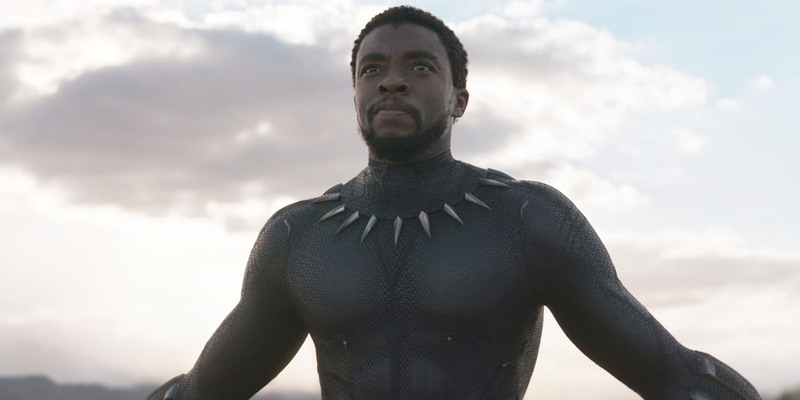 Black Panther star Chadwick Boseman has finally weighed in on the overwhelmingly positive fan reaction that poured in when the movie's cast first started coming together. #BlackPantherSoLit took over Twitter in May of last year in the aftermath of Michael B. Jordan and Lupita Nyong'o boarding the project alongside director Ryan Coogler. Social media widely celebrated the casting news, praising Marvel for embracing black culture and putting it front and center in its shared movie universe. Jordan and Nyong'o were only the beginning, of course, as Black Panther went on to add the likes of Forest Whitaker, Angela Bassett, Daniel Kaluuya, and Sterling K. Brown to its star-studded ensemble. Marvel has seemingly followed through on its promises of the Wakandan-set film featuring a cast that is 90 percent African or African-American, a major step forward for a cinematic universe whose lack of diversity has been called out more than once. When Screen Rant visited the set of Black Panther, we had a chance to ask Boseman about his thoughts on the fanbase's enthusiastic reactions. Though he did acknowledge that#BlackPantherSoLit eventually caught his eye, Boseman was quick to point out that his creative process doesn't allow him to get too caught up in public opinion. When T’Challa showed up in Civil War the fan reaction was just so huge, I think more than even a lot of people expected. Did seeing that reaction how excited people were over getting to meet to this character kind of impact how you approached this movie in any way? Chadwick Boseman: No. No. Because I’m not saying I expected the fan reaction to be what it was, but to a certain degree I’m unaware of the fan reaction. That’s number one. He’s like you don’t believe me. I don’t want to believe you. The #BlackPantherSoLit hashtag? Chadwick Boseman: I see it. I see certain things, but I see it in a different way because it’s important for me to not look at everything that’s happening so I see it because some stuff is impossible to not see. But there’s a certain removal I have to have from it in order to play it because you have people saying it’s got to have this or it’s got to have that and if you were to follow – if I was to follow their thoughts from the last one it would’ve been a lot of stuff that was wrong. So I think you kind of have to stay in it in a way where your decisions are made based upon the things that are organic – there’s a lot of storytellers here; all of the different departments are all storytellers and so your collaborating with them more so than you can the audience. You are collaborating with the audience, but if I was doing a play and I’m onstage with somebody and the audience responds we get that direct, you know, I know that that worked because you responded to it. But between blogs and this and that and journalists it’s like you can’t really put your foot in that. So I would say no it’s the fact that now in this case you have a new director that’s building on the steps of previous directors and writers and new writers. It’s the baby of Stan Lee and Feige. There’s so many other factors that come into play, various different writers and various different versions of the character so it’s a lot of stuff to put in that you are being influenced by. While Boseman certainly isn't the only actor that makes an active effort to avoid public opinion so that it doesn't impact his work, it would've been damn near impossible for him to have missed last year's so lit hashtag. The age of the internet has given a voice to virtually everyone in the world, so in order for Boseman to do his job, he can't be reading too far into the opinions of people he isn't working with. Regardless, here's hoping that #BlackPantherSoLit will be trending again next month, when the movie makes its theatrical debut.